After leading his Tucson, Arizona, high school team to an undefeated record and a state championship his senior year, quarterback Michael Lewis came to Lake Forest College determined to find similar success at the next level. He earned the back-up quarterback spot his freshman year and was expected to lead the team as the starting quarterback during his sophomore year. But before the season started, during a scrimmage in training camp in the fall of 2011, he was taken down on a play near the goal line and felt a large pop in his knee. The verdict: a dislocated knee and all four ligaments in the knee, the ACL, MCL, PCL and LCL, and posterior lateral corner were torn. Tearing even one ligament is a dreaded injury for any athlete; tearing all four almost certainly meant the end of Lewis’ playing career. Lewis was determined to recover and play football again, but he learned quickly how much patience he would need. He had to wait more than a month just for the initial swelling to go down before surgery could be performed, spending this time on non-weight-bearing crutches. His sports medicine orthopedic surgeon, Roger Chams, MD, from Northwestern Lake Forest Hospital, performed a complicated surgery using grafts to reconstruct the knee, completely reconstructing the ACL, PCL, LCL and posterior-lateral corner. Months of rehabilitation followed Lewis’ surgery, and he was able to re-join the team in the fall of 2012, again earning the back-up spot. Although he didn’t start any games last season, Lewis played in every contest and served effectively as a foil for opposing defenses that had little or no videotape on him. This season his comeback was complete. 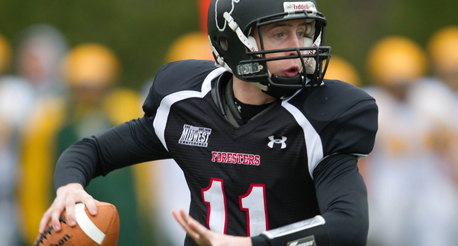 He started every game for the Foresters, leading the team to an 8-2 overall record and 7-2 mark in conference play. The Foresters won every home game for the second year in a row, matching the program record 10-game home winning streak set in 1910. Jim Catanzaro, head football coach at Lake Forest College, said after the final game of the season, “I couldn't be more proud of what this young man has overcome. I remember being at the ER with him that night and how sick he got. Put on top of that the months of rehab, and although he was told that he likely wouldn't play football ever again, he made sure that he did. He left it all on the field and had the best game of his career today. Our season wouldn't have been what it was without him."